Yes, my house could easily double as an IKEA showroom, but that's another story. The rainbow bookshelves are a fairly recent addition, because I needed to reorganize them and my art teacher friends enabled me to throw the alphabet by the wayside. Also, yes, I probably have way too much fun adding random nerdy bits to this office, but can you blame me? And in the vein of inspiration and things that I have just way too much fun with, creating cool novel aesthetics are another thing on my list of visual things that inspire me--with the added benefit of giving me great character and setting references for the WIPs I am working on. Sometimes it's really hard for me to find the right actor or reference photo, but with this one, they were just right there and perfect, especially Samira Wiley as Jesse, I mean, come on. These are my few pieces of inspiration today. A special shout-out to Claribel Ortega who started the #owmvoicesaesthetics that kicked off all the novel aesthetics-making! Do you have specific things that never fail to inspire you? 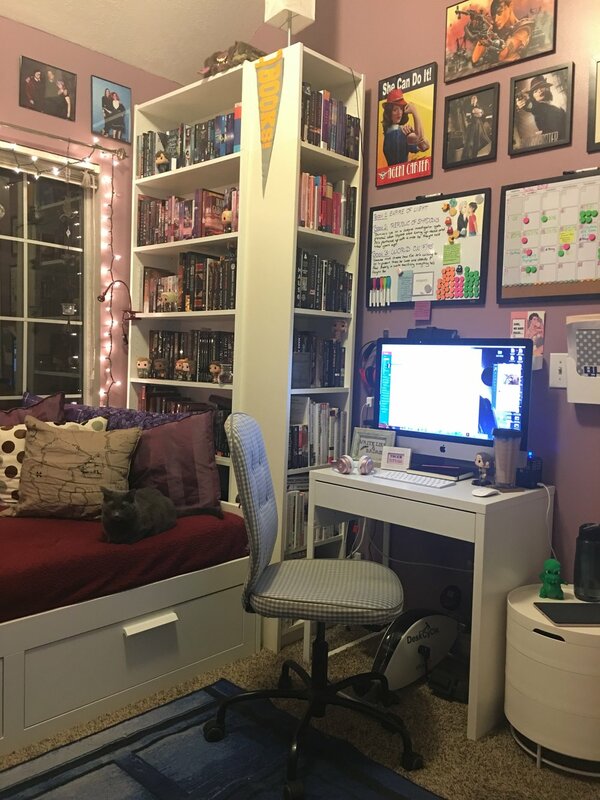 Show me your writing spaces and/or novel aesthetics! I'd love to see them!